Italian food thrives on tried and trusted flavour combos like meatballs and tomato sauce. 1. Put the bread and milk in a small bowl and let soak for 10 minutes. Remove the bread, tear into ½cm pieces and transfer to a large mixing bowl. 2. Add the pork, prosciutto, parmigiano-reggiano and eggs to the bread; season with salt and pepper. Knead until just incorporated. Cover the bowl with plastic wrap and refrigerate for 1 hour. Form the chilled pork mixture into golf ball-size balls. 3. For the tomato sauce, heat a large heavy saucepan over medium heat. Pour in the oil and heat until it's shimmering and almost smoking. Add the garlic and cook, stirring with a wooden spoon, until just beginning to brown, about 3-4 minutes. 4. Add the tomatoes and their juice, season with salt, stir in the chilli flakes and bring to a simmer. Lower heat and simmer until the tomatoes break down and the sauce is thickened, an hour or so. 5. Heat a large, wide, non-stick pan over medium heat. Add the olive oil and heat until almost smoking. Add the meatballs and cook, turning occasionally, until they are browned all over. Pour in the capsicum and the tomato sauce and bring to a simmer. Reduce the heat to a medium-low, cover the pan, and simmer until the meatballs are cooked through, about 20 minutes. 6. 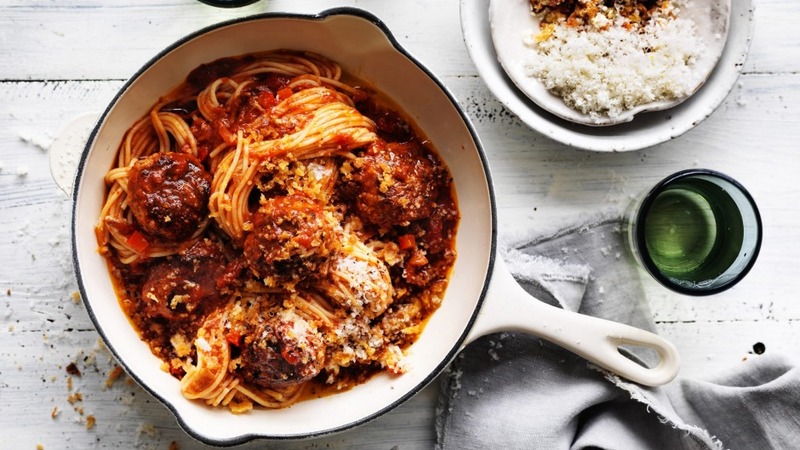 Take 4 bowls and spoon the meatballs in and top with sauce, add grated parmigiano-reggiano, a drizzle of extra virgin olive oil and a grind of pepper, then serve with the toasted bread crumbs. Tip: The meatballs can be served with spaghetti, but they also work with a short pasta such as penne or on a mound of polenta.